Growsgreen provides full landscape design layouts for modern, functional gardens. My modern designs juxtapose the organic shapes and textures of plants with the geometry of the material palette and garden layout for an organic modern look and feel. My gardens are designed to their locale, California, using low water plants. The best parts of the process for me are working with amazing clients and having the creative freedom and trust from my clients to transform their garden space to include my aesthetic signature while meeting their functional objectives. Clients that value well planned design will note that this is my forte- the bones and hardscape of the garden. In the reconfiguration of the garden, I combine my understanding of what well designed hardscape can do for the space visually and functionally and I emphasize materials that make the space feel cohesive. The most successful collaborations are when the client and I have a compatible aesthetic. My process begins with an initial consult to discuss the scope of the project and preliminary ideas, followed by an estimate of time needed to complete the design plan. It is helpful to have a scale map made of your garden that I use to create your unique garden design. 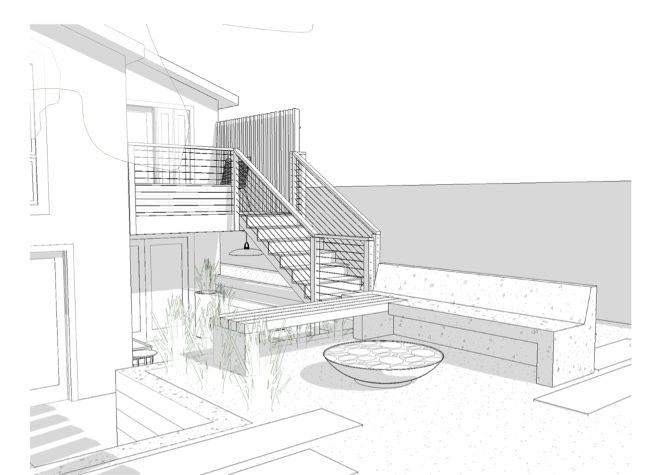 Through sketching and photos, I come up with a feeling and look for the space and draft the garden design in Autocad. Once the concept is completed, we finalize the details of materials and scope of work so you can get an installation estimate from a licensed landscape contractor. While you work with them directly to get your garden installed, I am involved in the process for design questions, site visits and plant placement. Other services Growsgreen offers includes one-time consultations for those looking for advice for editing their existing garden planting palette. I also offer interior design services. Growsgreen is not well-suited for clients looking for piecemeal hardscape design work versus redesigning the full garden space nor if you already have a very detailed vision of what you want for your space.